BRASS NICKEL BRONZE EASEL 30cm PLATE DISPLAY PICTURE STAND PHOTO WEDDING B04-12"
BRASS NICKEL BRONZE EASEL 25cm PLATE DISPLAY PICTURE PHOTO STAND WEDDING B04-10"
Solid Brass Decorative Brass Easel. 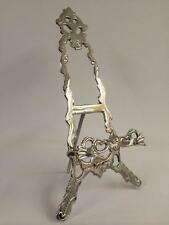 BEAUTIFUL ORNATE BRASS DISPLAY / EASEL STAND, THIS FANTASTIC ORNATE BRASS DISPLAY STAND IS IN SUPER CONDITION, BEAUTIFUL DESIGN IT STANDS 25.5 CM TALL AND IS 11 CM WIDE AT THE BASE, FANTASTIC ORNATE ITEM. 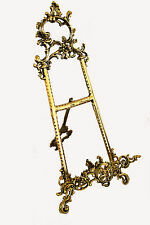 ITEM = "baroque" Italian Decorative Brass Picture Easel - 15cm X 33 Cm // £9.99. will try my best to help. CONDITION = very good condition, no box / loose ( as pictured ). Small decorative brass picture easel. BRASS NICKEL BRONZE EASEL 16cm PLATE DISPLAY PICTURE STAND ARTIST WEDDING B04-6"
A very useful and attractive sturdy small brass easel stand. It can be used for small pictures or ceramics. The two arms at the base are articulated and can be moved to accommodate the item. The portrait miniature is not included in sale but shown for demonstration. 7ins/18cm high (irrespective of width) would leave the ornate top part of the easel visible. would obscure the ornate top part of the easel. 1in/2.5cm thick. Ornate Decorative Brass Easel. Condition is Used. Dispatched with Royal Mail Signed For® 2nd Class. BRASS NICKEL BRONZE EASEL 22CM PLATE DISPLAY PICTURE STAND ARTIST WEDDING BO4-8"
Large decorative brass picture easel. Holders, each holder is 14.5cm tall 12cm wide. The easels have been used at a wedding and are in VGC. These have been chalk sprayed, giving a shabby chic 'Antique white' style. This will take a picture of 89mm x 51mm - there are only 2 of the picture back plate holders left with 3 missing but the thin plate is a tight fit so is not a problem.